Nagarkot Guide (P)Ltd. offers overland journey to Mt. Kailash and Manasarovar from Kathmandu. The entire tour and trek including parikrama around Mt. Kailash is fully supported with latest camping equipments and services of our well experienced Sherpa team. It is indeed a rare opportunity and privilege for all devotees who have been dreaming to be close to the home of Mahadeva or who are simply in search of magic of nature!! Mount Kailash & Manasarovar region is steeped in religion and mythology and every year thousand of pilgrims traverse some of the remotest and toughest regions of the mighty Himalayas to pay their obeisance to Lord Shiva. It is a land where Lord Shiva lives with his consort Parvati. According to ancient religious texts, the abode of creator Brahma is called Brahmaloka, the abode of Lord Vishnu is called Vaikunta & the abode of Lord Shiva is called Kailash. Of the three, one can only go bodily and return in this life from Kailash having experienced divinity. Hindus believe that Gods come to bathe every morning in holy lake Manasarovar between 3 to 5 am and this time is called 'Brahma-mahurat'. The word Manasarovar is derived from the Sanskrit word 'Manas' which means mind & legend has it that Lord Brahma created this lake from his mind. 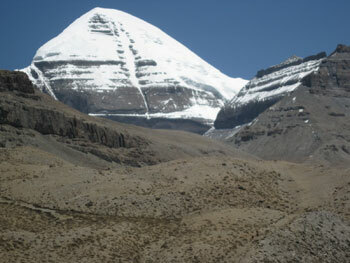 Situated in the south-western part of Tibet bordering the Kumaon hills and Nepal, is Mount Kailash. It is supremely sacred mountain, cosmologicaly related with Mount Meru, the great mythological mountain that forms the axis of this world system. Being a central watershed of Asia, it has always been the most sacred of mountains for Hindus, Buddhists, Jains and Bons. The Kailash Yatra is a Spiritual quest and a Pilgrimage . The darshan of Mount Kailash and its parikrama along with spiritual bath in Holy Lake Manasarovar is the goal of Kailash yatra. If required, other arrangements and schedule of the yatra will be altered to ensure the main objectives are achieved and yatris are expected to cooperate with the same. Kathmandu, overnight at hotel (twin sharing). Day 03: Kathmandu -Tatopani – Nyalam 3800 m (50 kms). Early breakfast or packing, departure to Kodari border. Complete Nepal side immigration formalities, secpnd we proceed for china immigration and custom formalities. We cross over to Zhangmu ( border Tibet side )and here we meet our Chinese guide, drivers and vehicles( Land Cruiser or Luxury Bus) .After assigning vehicles to yetis we continue drive to Nyalam ( our first overnight in China) , dinner and overnight at lodge in Nyalam ( min 4 pax sharing ). Day 04: Nyalam – Day free for acclimatization. Whole day we are here for the acclimatization, a short trek would be planned to nearby Nyalam hill . All meals will be provided, overnight at lodge in Nyalam . Day 05: Nyalam –Saga – Dongba- Paryang. 4500 m (475 kms ). Day 07: Manasarovar Parikrama – Darchen 4560 (55 kms). Day 08: Darchen – Tarboche – Yamdwar- Diraphuk (4765 m) 12 kms trek. Day 09: Diraphuk – Drolma-la pass -Zutulphuk ( 4700m ) 22 km trek. Day 10: Zutulphuk- Darchen – Manasarovar. 8 km trek. We are returning home - leaving this holy place, after breakfast drive to Paryang/ New Dongba , lunch en-route , dinner & overnight stay at Guest house. After breakfast drive to Nyalam .Overnight & Dinner in Guest house..
After breakfast drive from Nyalam to Zhangmu border, post immigration and custom formalities – cross over to Nepal border, lunch at Tatopani - drive to Kathmandu . Overnight at Hotel Holy Himalaya or Hotel Malla at Kathmandu. Day 14: International Departure from Kathmandu. Breakfast at hotel and check - out by 12:00 noon. for transfer to airport. 1. Kathmandu airport transfers on arrival and departure. 2. 3 nights on twin - sharing accommodation at 5 stars Hotel for land cruiser and 3 stars for Bus package in Kathmandu on AP basis. 3. Half day Sightseeing tour in Kathmandu with English - speaking guide. 4. Transfers from Kathmandu to Kodari border and back in Non A/C buses. 5. All applicable taxes & service charges. 1. 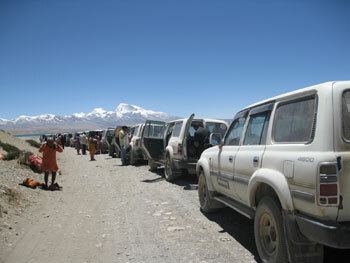 All surface transport in Tibet by land cruisers 4500 CC / Coach with supporting truck. 2. Freshly cooked 3 vegetarian meals and morning / evening tea or soup with snacks every day by our experienced cook / Sherpa staff. 3. Mineral water will be supplied in Jerry cans for drinking purposes. 5. Duffle bag (bag for keeping personal clothes & equipments) and Day bag will also be provided with compliments from Himalayan Exodus treks and tours in clean comfortable guesthouses throughout the trip. 8. Yaks with yak drivers for carrying only camping luggage & cooking equipment's during the Kora. 9. Emergency Oxygen cylinders, Medical kit carried by Sherpas during Kailash Kora. 1. If need Services of Ponies & Porter during Kailash Kora, early request to our guide is necessary and the cost will be borne by guest on the spot. Beware of the possible risk being thrown out by the ponies. 2. Any expenses of personal nature such as travel insurance, drinks, laundry, telephone / fax calls, porters or arranging additional transportation. 3. Any additional expenses caused by reasons beyond our control such as natural calamities ( landslides, floods), flight delays, rescheduling or cancellations, any accidents, medical evacuations, riots, strikes, evacuation costs , visa splitting charges etc. 4. If needed, charges for a special JACKET to prevent from Tibet cold conditions. 5. Services other than specified. To confirm the booking for your Kailash Yatra, you need to send us initial booking amount of INR 25000, by Cash/Cheque - bank transfer to our account at the time of booking along with duly signed booking form and the balance should be cleared 15 days before your departure from India by demand draft/bank transfer/Cheque/Cash . Yatris need to provide a photocopy or scan of their passports at the time of booking. Additionally, we collect the original passports 15 days prior to your travel date. The passports will be returned to yatris only a couple of days before the start of yatra in view of the lengthy permit and visa process. Yatris should avoid anxiety on account of passports. In extreme cases we may request Yatris to arrive at Kathmandu using their Voter ID as these are sufficient for Indians to enter Nepal. In such cases the passports will be given to Yatris in Kathmandu after the China visa formalities.Your passport should be valid at least six months from date of travel. It is the sole responsibility of passengers to pay the tour price by the due date. Passengers can cancel their tour 30 days before their departure; of which the former prepaid booking charge will not be refunded. Please send your cancellation by fax or email, Oral cancellation will not be entertained. * We do plan the arrangements in advance. It is unlikely that we will have to make any changes to your travel arrangements or itinerary, we reserve the right to do so at any time. If there are any changes, we will inform you of them at the earliest possible date. We also reserve the right in any circumstances to cancel your travel arrangements by assigning valid reasons to you. If we are unable to provide the booked travel arrangements due to reasons beyond our control (for bad weather, Political reason/Permit delay) we shall try to offer you alternative dates for the tour if the tour hasn't already commenced, but if the tour has already commenced we shall refund the booking price charged from you on a pro - rata basis depending on portion of the tour standing utilized by you . ** We act as an intermediary between the concerned airlines, hotels, transport - operators and local tourist offices providing the services. We & our sub agents are therefore not responsible for any loss, injury sustained by the tourist, including those occurring outside the touring programs. Additional expenses incurred due to delay, accidents, natural disaster, political actions and unrest must be borne by the tourists. Program, prices, services and conditions are based on those valid at the time of printing and therefore subject to change without any advance notice before or during the tour. * For Any additional service booked and cancelled later due to any reason whatever, service charges would be deducted. * It is an offence to carry Indian currency of denomination of Rs 500 /- and Rs 1000 /- in Nepal. *Rest of the terms & conditions as per the brochure and booking form. Accommodations and dining aren't difficult to discover, from high-end hotels to luxury lodges, you can find options for any types in Nagarkot. Web design by Nepal Media.